To add a new Connection, you will click on Add Entry under the main Connections Menu. If you click Edit from the Manage Connections page, or on a Connection's name from anywhere else within the Connection's pages, you can edit an that existing Connection. Whether you are creating a new Connection or managing an existing one, you will be prompted with the same set of fields. Public - Anyone viewing the site can see this information. Private - Only users with access to edit the site can see this information. They must be logged in to do so. Unlisted - The information does not display on the website at any point. It is only visible through the control panel. Preferred - This button does not affect how anything is displayed on the site. This is for internal use only if you wanted to make note of a preferred contact method. 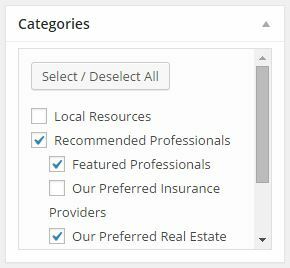 The Name section allows you to update the Name, Title, Organization, and Department of a Connection. Images are used within the Bio portion of a Connection's page. You can choose to Display the image, or leave it as Not Displayed so that it is available in the control panel only. Logos are used in the preview snapshot for a Connection as well as on the Connection's full page. You can choose to Display the image, or leave it as Not Displayed so that it is available in the control panel only. Addresses can be added for Home, Work, School, or Other. Phone numbers can be added for Home Phone, Home Fax, Cell Phone, Work Phone, and Work Fax. Both a Personal and Work Email can be added. If a Connection uses any Messengers such as AIM, Skype, or Yahoo IM, you can add their ID here. Social Media IDs can be added for about 30 different pages. The link will add an Icon for that particular Social Media site. 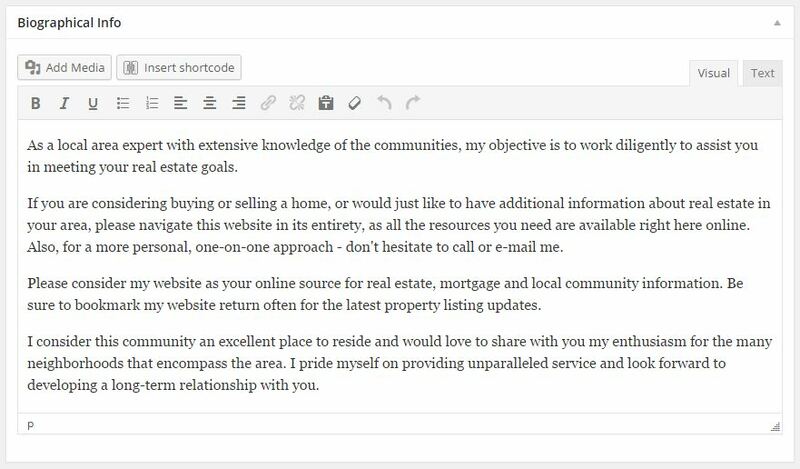 A Connection can include a link for a Website as well as for a Blog. You will always want the link to open in a New Window so they are not taken away from your site entirely. Many different dates can be added to a Connection such as Birthdays, Anniversaries, Graduation, and more. The Biographical Info section is where you will provide information about a Connection, whether that be a Staff Profile, or a Business Description. Notes are designed to supplement the Biographical Information and can provide extra information that you want separated from the Bio. Custom Fields can be created for anything you may want to add that doesn't fit the predefined fields. This can useful for adding things such as License Numbers. 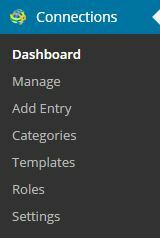 Connections can be added to one or more categories. Categorizing your Connections makes navigation easier for your users. 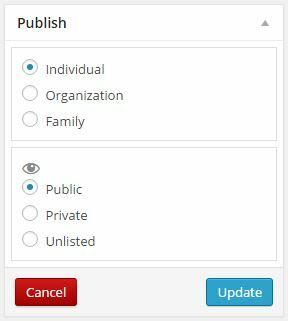 Once you have added or updated all of the information for a specific Connection, you can now Update or Add the Connection to your site. You can first select whether the Connection is an Individual, Organization, or Family. You also have the option to set the entire Connection as Public, Private, or Unlisted. The Update button will display Add Entry for new Connections.